The Pianoduo Festival under the artistic leadership of the Dutch Pianoduo Scholtes & Janssens took place for the fifth time in Amsterdam this year and October 13th I attended a concert titled Modern Masters. Before the concert musicologist Leo Samama gave a short lecture on North American Classical music after the second World War. The concert of the Maltese-Belgian duo Gabi Sultana & Mirek Coutigny consisted of works for piano duo of well – and not so well – known US composers. Most of the works where written for two pianos but some were also played four handedly on one piano. I had heard such repertoire before but always thought these works were more of peculiarities and outliers in the larger corpora of composers. And they probably are, but apparently there are enough compositions, not only to justify a dedicated festival, but also enable a group of pianists to specialise in this repertoire. A quick googling revealed that there are thousands of compositions written for more than one piano and/or more than two hands, although I couldn’t find many of the evenings works in these listings. Although the North American developments were also discussed during my musicology studies at the University of Amsterdam, I don’t recall the different approaches to music in opposite sides of United States being discussed in the terms Samama did in his lecture. He pointed out, that while the composers on the East coast where closely following developments in Europe and continuing the continental tradition of progressivist modernism, the West coast composers looked the other way to Hawaii, Japan and the rest of Asia for inspiration. They were also more interested in how the folk, rock and pop artists made music than in their more scientifically minded colleagues at the East coast. Artists were of course looking across the genre “fences” from the rock and pop side as well. Towards the mid 1960s e.g. members of The Beatles started getting interested in broadening their musical horizons, each in their own way. George Harrison turned to Indian philosophy and music, Paul McCartney was more interested in honing his composing skills inspired by the Western art music tradition and John Lennon was more oriented with the folk ways of making music. As they worked out their musical ideas largely together in the studio, the final recorded versions were likely to a combination of many of the above directions. So e.g. the Norwegian Wood of John Lennon is a folk song with some Indian influences. But whenever they have the chance people tend to look over the fences everywhere. Some 20 years later the Japanese author Haruki Muarakami wrote the novel Noruwei no Mori inspired by Lennon’s song. In 2010 Tran Anh Hung directed a film based on the book. The levels of cultural and linguistic translation as well as the artistic experiences travelling through time and space in these works are intriguing, but have to be discussed another time. The Beatles’ Rubber Soul album inspired e.g. The Beach Boys to make their Pet Sounds to which again The Beatles responded with the Revolver album. For Eleanor Rigby Paul McCartney asked the producer George Martin to write a string arrangement. All these and other experiments went on in the rock/pop circles leading up to the Progressive Rock of the 1970s and on. The East and West coast composers had also a different reaction to the horrors of World War II. The rise of the Nazis drove most of the left leaning – mostly Jewish – intellects to exile, many across the Atlantic. Among those immigrating to the US before and during the World War were e.g. the composers Arnold Schoenberg and Igor Stravinsky and nearly all of the Frankfurt School philosophers. They had witnessed first hand the Enlightenment project leading to sentimental National Romantic ideals and together with unchecked emotions resulted in the concentration camps and genocide. What the Nazis called the “Final Solution” has been viewed as the “unexpected” result of a blind belief in technological progress. Nevertheless, this hasn’t been enough to everyone away from modernist beliefs, and the response of composers on the East coast – although Schoenberg actually lived in California – was to dig deeper into the modernist scientific approach to music-making; incorporating the latest technologies and theories to create new music that would be more “rational” rather than emotional in content. Some referred this development as the “American academic avant-garde”, although views differ on this. Also in Europe this kind of thinking prevailed in the so-called Darmstadt school, to which the above quoted Adorno was also a frequent attendee. The Darmstadt school composers first continued working on the ideas of composers the Nazis had oppressed, such as Schoenberg and Stravinsky. Schoenberg’s A Survivor from Warshaw is one of the best known early musical responses to the Holocaust. Composed using the twelve tone technique Schoenberg had been developing already before the war, the Survivor is an expressionistic commemoration of the horrors Jews faced during the war. Luigi Nono, one of the most prominent members of the Darmstadt school, continued Schoenberg’s musical legacy. While not directly reacting to the war, Nono’s strongly Marxist criticism in his work in the decade after the war is in line with Adorno’s and Horkheimer’s critic mentioned above. I’ll stop here for now. I’ll be back shortly with a few words about the actual performance that evening. Approaching arts – and human experience in general – from the perspective of multimediality can be fruitful in opening different ways of understanding these experiences. We perceive the world first through our bodily senses and then construct various understandings and experiences of this sensory data through complex cognitive processes. While much of these experiences are non-conceptual I will here discuss mostly the ways in which music is conceptualised by using terminology from other artistic media. I. e we understand – or communicate our understandings of – music using words originally, or more often, used to describe other artistic media or realms of human experience. Multimediality in music begins with one of the oldest ways of music-making; singing. Although, as discussed before, singing may actually have preceded language and been a sort of “protolanguage”, singing as we usually think of it includes text, lyrics. Performance of music is always multimedial. Multimediality cannot really be discussed without also addressing some neighbouring terms. Intertextuality became hip in the academic discussions of arts since at least in 1980s. It’s a helpful tool in analysing and understanding the ways in which meanings are created in multifaceted ways by various techniques such as quotation or some sort of reference. As discussed before, these techniques have been central to black American music-making since the times of slavery to the contemporary hip-hop. Intertextuality tends to fall short when applied to performing arts. While there are certain benefits in reducing everything to “texts”, two dimensional layers of meaning, this comes with a cost when studying music as a performative phenomenon, e.g. through Christopher Small’s “musicking”. Multimedality is a more helpful concept in helping us study and understand how different artistic media are used, and can be used, to reflect and create rich human experiences by drawing from the tools and strengths of the different media in our disposal. Multimediality in music is an old idea as music has always been a part of some “extramusical” performance or context such as a ritual. In fact “pure” music is one of those 19th century Romantic ideas still to some extent holding our experience of music captive. But more about that another time. The gesamtkunstwerk of Richard Wagner‘s opera remain perhaps the most iconic examples of effort to bring all the art forms together. Whereas Wagner’s operatic works might stand as the ultimate artistic expression of modernity, the 21st century post-modern artists produce more fragmented works. Whereas black American music has got from the cotton fields to White House (see below), western Classical music is now performed by native orchestras and singers all over the world – here also conducted by a woman, something which in Wagner’s time was quite unthinkable. Multimediality here includes also video projections and TV production. Earlier I discussed how Jacob Collier presents his multifaceted talent in his YouTube videos and how Janelle Monáe implies multiple – or perhaps fragmented – identities in her performances of the song Tightrope with means of music production, the “music itself” (e.g. melody, harmony, groove), lyrics, video, live performance, etc. The Dutch group Tin Men and the Telephone is also a very interesting example of musical art that draws from multiple media in a very interactive way on and off stage. Janelle Monáe’s performance in the White House by Barak Obama’s invitation has various multimedial layers. As discussed earlier, her performance style is rich in references to other black American artists, perhaps most notably in the James Brown steps in her dance moves. In this performance the “Funkiest horn section of Metropolis” becomes that of White House, opening up a myriad of interpretations. Here’s Jacob Collier embracing the social medium of music making in a contemporary digital manner enabling music-making together across temporal and spacial boundaries. Tin Men and the Telephone do various things with different media from “musicalising” recorded speech and other sounds to typing with the piano keyboard and collaboration with their audience through a special app. One interesting form of multimediality is that of music in literature; the use of description of music in literature and use of musical techniques in writing. 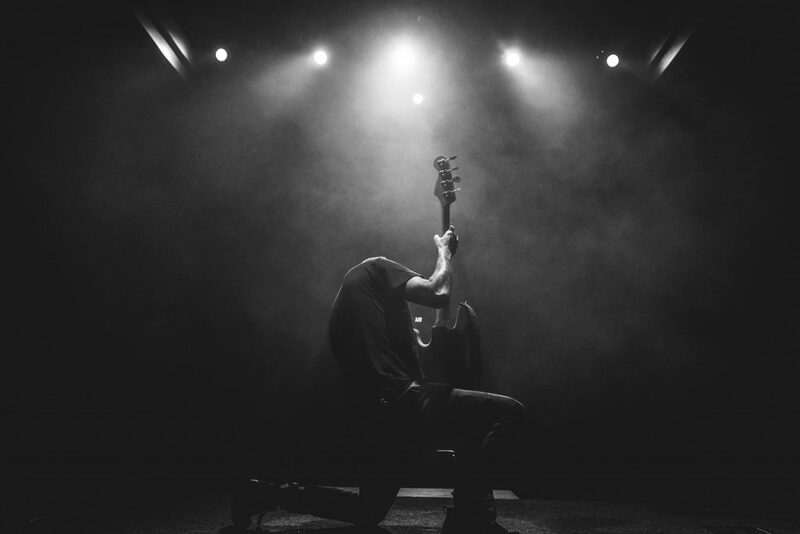 Describing music in words requires quite an effort from the writer and reader alike to convey and share an artistic experience across the media. To describe art of one medium with the means of another requires sharing cultural understanding on a deep level and the ability to imagine, in this case, music described with words. When I first tried to read Toni Morrison’s Jazz, in the age of around 15 or so, I expected it to be “about jazz”. I didn’t understand much about it and quickly gave up. Recently I picked up the book again and was better able to appreciate the ways in which Morrison took jazz as a metaphor and method and used its compositional and performative techniques to tell the story of her book. Like a jazz performance the book has a main theme, a story it wants to tell. However, the main characters are also given “solo spots” to elaborate on their personal stories giving depth to the main story and enabling the reader to approach – perhaps even experience – the story from the individual perspectives of the characters; much like in jazz performance the “tune” is approached differently by each of the soloists. 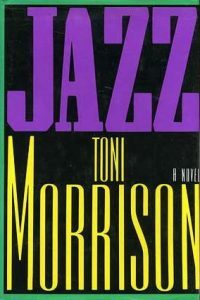 Jazz in Morrison’s book is also a metaphor for the black American struggle and experience. As briefly discussed before, jazz has come a long way from an unappreciated folk music symbolising the worst of human kind – even among some black Americans – to be heralded as the “American Classical music”. 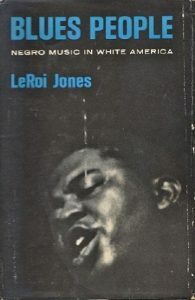 Whereas Amiri Baraka in his Blues People elaborated on the idea of “music as the history of black Americans”, Morrison gives the bones of this history the flesh of her characters. Amiri Baraka’s Blues People elaborates on the idea of music as the history of black Americans. At the time I’m typing this the first black American president has just stepped aside to make space for another yet white male, one whose rhetoric and first deeds clearly show how the struggle for human rights is far from over. Morrison’s story takes place in a period prior to the Civil Rights era when many – as some of the characters in the book – still had vivid personal memories of the Jim Crow treatment of blacks. The painting on top of this article is the Garden of Earthly Pleasures by Hieronymus Bosch from 1500. As sound is difficult to picture music in visual arts is mainly pictured through instruments and musical acts such as dancing and singing. 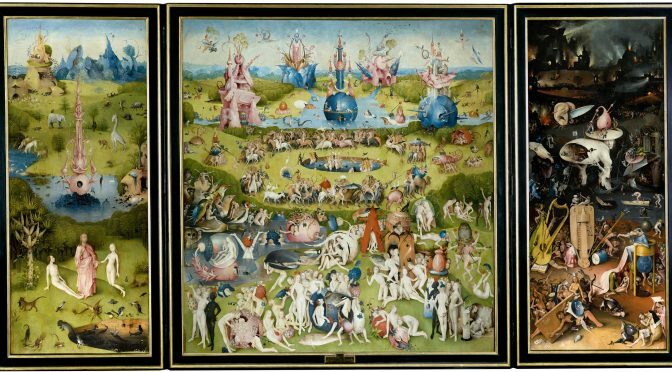 Bosch’s painting is a classic one portraying music as a sinful – or at least not respectable – activity through placing some instruments of the time together with people busy with Earthly orgies. The pianist Bill Evans wrote liner notes for the 1959 Miles Davis quintet album Kind of Blue, I’ve also discussed earlier. In his text Evans makes an analogy between the Japanese calligraphy shodō and jazz improvisation. He stresses the temporal nature of both media; just as the stroke of a brush leaves its mark on the paper and cannot be undone or altered, a musical sound cannot be taken back. Further challenge in jazz improvisation is the group setting in which it most often happens; there are in fact many “brushes” making strokes simultaneously to the “canvas” of temporal framework set, in this case, by Miles Davis. I recently ran into this term in an interview of the Dutch group Jerboah in which they described their music using this term. As prefixes like post, pre, neo, etc. tend to be used in various – more or less defined – ways by e.g. musicians, scholars and journalists, I thought it’s worth looking into. Please, stay tuned as I’ll be back shortly with some more thoughts about this topic. We (the western world) have inherited from the 19th century a number of ways in which we experience and think about music. I’ll discuss some of them in light of some examples I’m sure everyone can relate to as well as some of the observations Nicholas Cook wrote about already in the end of the last century (or millennium, if you will). E.g. the notions of musical genius, roles of composer, director, performer, listener, ideas about different kinds of music (art music, folk, pop, etc.). The Finnish composer Jean Sibelius has been quoted as saying something like: “The best thing in music are the rests”. The Finnish word for rest can also be interpreted as meaning break, which renders the quotation somewhat ambiguous as it could be referring to intermission. Be that as it may, music has also been described as the ultimate art of manipulating time. The experiential opposites between musical time and “non-musical” time become apparent with e.g. John Cage’s composition 4’33” and they way in which people nowadays manipulate there experience of the surrounding world by imposing their chosen soundtrack on it through portable music players and headphones/earbuds.